Product #46466 | SKU TAA032CAN | 0.0 (no ratings yet) Thanks for your rating! 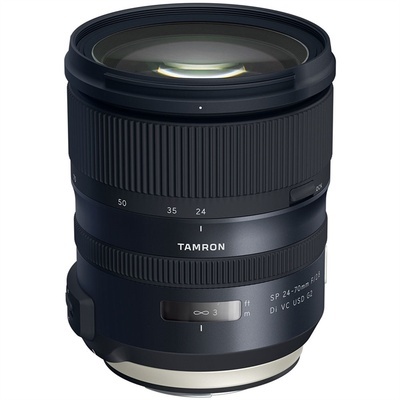 Characterised by apt focusing speed and image stabilisation, the Canon EF-mount SP 24-70mm f/2.8 Di VC USD G2 from Tamron is a revised fast standard zoom covering a versatile wide-angle to portrait-length range. A sophisticated optical design with two extra refractive elements, three low dispersion elements, three glass-moulded aspherical elements, and one hybrid aspherical element helps to suppress aberrations and distortion throughout the zoom range while eBAND and BBAR coatings have been applied to individual elements to control lens flare and ghosting for improved contrast and colour fidelity. Balancing its optical attributes, this lens also utilises a USM autofocus motor to deliver notably quick, quiet, and precise focusing performance that suits both stills and video applications. Also, 5-stop-effective Vibration Compensation helps to minimise the appearance of camera shake for sharper handheld shooting in difficult lighting conditions. Additionally, the lens is moisture-resistant and has a fluorine coating on the front element to enable its use in trying environmental conditions. Standard zoom is designed for full-frame Canon EF-mount DSLRs, however can also be used with APS-C models where it provides a 38.6-112mm equivalent focal length range. Bright f/2.8 constant maximum aperture affords consistent brightness throughout the zoom range, and benefits working in difficult lighting conditions. Two XR (extra refractive) and three LD (low dispersion) elements are featured in the optical design to noticeably limit colour fringing and chromatic aberrations for improved clarity, colour fidelity, and apparent sharpness. Three glass-moulded aspherical elements and one hybrid aspherical element help to reduce chromatic aberrations and distortion throughout the zoom range to deliver notable sharpness and accurate rendering. Both eBAND and BBAR coatings have been applied to suppress ghosting and lens flare for improved contrast when working in backlit conditions. VC image stabilisation helps to minimise the appearance of camera shake by up to 5 stops or more effective handheld shooting in difficult lighting conditions. Separate VC modes are also available to suit various styles of shooting: Mode 1 is a balanced setting for general use, and promotes both a stabilised viewfinder image and stabilised results, while Mode 2 is designed exclusively for panning movements. An Ultrasonic Silent Drive autofocus motor delivers quick and precise focusing performance to suit working with moving subjects. This motor also affords full-time manual focus control, and it is possible to focus on subjects as close as 1.25' away.